We invite you for a November trip to Ojcow and Ojcowski National Park - We're going from Krakow! Who could not go in October with us on a trip to Ojcow and Ojcowski National Park has the opportunity to go there with us in November! Again, we are traveling by bus or coach [depending on the number of volunteers] to the Prądnik Valley. We invite you for a joint guided tour to the Bat Cave and Pieskowa Skała Castle. This is not all we will see! Of course, we can not bypass places like Maczuga Herkulesa, Brama Krakowska or Source of Love. 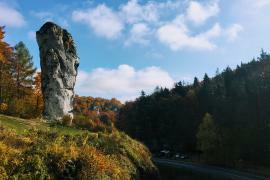 All this and more you will see together with the licensed guide of the Ojcowski National Park, who will take away the greatest mysteries of this valley and tell the curiosities hidden in the local historical nooks and crannies. When are we going on a trip? You can choose between 3 and 4 November 2018. We are starting from Krakow, and more specifically from under the Groteska Theater - on the intersection of Krupnicza and Skarbowa Streets. There at 9:00 we get on the bus and go on a trip.